Cradled between distant mountain ranges and vast oil fields, a fresh capital hums like a young Dubai, as students and businessmen stroll about modern buildings built with the revenues brought by the black gold that rests beneath Kurdish Iraq. Growing oil profits and increased international investment in the region have facilitated a renaissance for Iraq’s Kurdish population following the American ousting of Saddam Hussein, yet Baghdad and the capital of the autonomous Kurdish regional government (KRG) Erbil continue their rocky relationship. After the Baathists waged a genocidal campaign in the 1980’s and left over 100,000 Kurds dead, the Kurds wanted to maximize the distance between themselves and Baghdad. The United States, committed to the territorial integrity of Iraq rejected proposals for Kurdish independence, and instead crafted a power sharing agreement that carved out a self-governing government within Iraq. The Sunni Kurds are weary of subsidizing a violent and economically underperforming Shi’ite based regime in Baghdad. Tensions between Erbil and Baghdad have multiplied, leading to confrontations over exploration, import, and export rights over oil found in Northern Iraq. The power sharing agreement remained steady for a decade, but new flows of foreign investment into the KRG’s oil and gas sector have allowed Kurdish frustration to vent. Control over the sizable oil and gas reserves in Kurdish Iraq is quickly becoming a flashpoint between a Kurdish population set on autonomy and statehood and a central government desperately trying to contain smoldering domestic discontent. In 2012 Iraqi and North Iraqi crude production averaged over 3 million barrels per day; despite fluctuation in production capacity due to disagreements with Baghdad, the KRG is on track to produce about 400,000 barrels per day by the end of 2013. Disagreements over exploration and production agreements with foreign firms have caused conflict between the KRG and Baghdad. The Kurds claim that the Iraqi constitution allows autonomous regions (thus the KRG controlled area) to develop and produce from new fields, in joint ventures with other gas or oil firms. The “Oil and Gas Law of the Kurdistan Region – Iraq” confirms that the public Kurdish Exploration and Production Company may “enter into joint ventures and similar contractual arrangements, whether in the Region, in other parts of Iraq or abroad.” Baghdad maintains that it is illegal for foreign firms to unilaterally engage the regional government in exploration and production agreements. The central government claims the oil revenue should be distributed nationally, despite its location in the Kurdish region. The oil fields of northern Iraq are significant – in some places it all but oozes forth from the ground. Iraq is home to the fifth largest proven oil reserves in the world, roughly 141 billion barrels as of January 1, 2013. The nation has surpassed fellow OPEC member Iran as the second largest producer within OPEC at the close of 2012, because Iran’s largest Asian customers have cut their imports while the U.S. and Europe tighten energy sanctions. The KRG governed area holds around 17% of Iraqi oil reserves near Kirkuk, Mosul, and Khanaqin. The International Energy Agency has estimated Kurdish Iraq holds around 4 billion barrels of proven reserves. Due to the large oil reserves, the KRG is cultivating a blossoming relationship with neighboring Turkey. The construction of a new pipeline that would transport Kurdish-Iraqi oil to Turkey is set to come online this year. The Dohuk-Fishkhabour pipeline would run straight from the KRG area to Fishkabour, an Iraqi town within three miles of the Turkish border. It will likely connect to the Kirkuk-Ceyhan pipeline terminating in the Turkish energy port Ceyhan, though whether the new pipeline will connect on Kurdish or Turkish soil is unclear. This pipeline will offer up greater market access for Kurdish Iraq. The attractiveness for foreign firms to explore and produce in Kurdish Iraq is rapidly growing due to the region’s relative security and plentiful reserves, particularly when compared to the rest of the war-trampled country. In 2012 Iraqi and North Iraqi crude production averaged over 3 million barrels per day; despite fluctuation in production capacity due to disagreements with Baghdad, the KRG is on track to produce about 400,000 barrels per day by the end of 2013. The Kurdish region of Northern Iraq produces crude oil through production sharing agreements with international companies, eschewing the state owned model favored by Baghdad. All official oil exports, Baghdad claims, must go through the Iraq-Turkey pipeline terminating in the ports at Ceyhan, Turkey or Basra, southeastern Iraqi port on the Persian Gulf (see map). The contents of the pipeline belong to the State Owned Marketing Association, SOMA, and thus to Baghdad rather than Erbil. Baghdad is downplaying the KRG’s growing economic power, vehemently stating that the oil and gas exploration contracts the KRG has signed with foreign firms are illegal because they have not involved Baghdad, and thus is laying the groundwork for companies to question the legality of their agreements with the KRG. The latest case is the Dana Gas suit against the KRG. Pearl Petroleum, a company owned by Dana, Crescent Petroleum (listed with Abu-Dhabi and based out of The United Arab Emirates), Austria’s OMV, and the Hungarian oil and gas group MOL, is demanding clarification from the government’s Ministry of Natural Resources regarding its contract with the KRG. Baghdad argues that the KRG cannot unilaterally sign exploration production agreements with foreign companies; such agreements must meet Baghdad’s approval. Pearl Consortium wants to know how much money they are owed for work already carried out, and their legal status to further develop and market gas fields, Khor More and Chemchmal. Pearl Consortium has invested over $1 billion in the North Iraqi fields so far. ExxonMobil, Chevron, and Total have contracted with the KRG, but in doing so risk their contracts in the Baghdad-controlled south. This unresolved legal environment makes investing in exploration and production in KRG-controlled Iraq risky, particularly to firms with projects in Baghdad controlled southern Iraq. Baghdad could potentially threaten the southern projects if firms exploring and developing in Kurdish Iraq refuse to side with the capital. Turkish firms like Genel and major international oil company ExxonMobil are continuing to explore and produce crude oil in the KRG region, but they do so risking Baghdad’s ire. Baghdad has prohibited private Turkish planes from flying into KRG air space in response to Turkey’s progress on energy deals with the KRG. On November 29, Baghdad made good on its ban and turned back a private Turkish plane from KRG airspace. Baghdad can also threaten the legality of business deals foreign international oil companies (IOCs) sign with the KRG, because Baghdad demands that all such business agreements must involve the central government. If Baghdad refuses to settle and accept the agreements between the KRG and foreign IOCs as legitimate, then the IOCs are risking their hydro-carbon operations, as the central government could take measures that would worsen the business environment and scare off investors. While the central government could threaten IOC projects in the south, the KRG tempts these companies with significant resources and a stable working environment. Kurdish Iraq has been a relatively safe and prosperous region for its five million Kurdish residents. Unlike the rest of the country, terrorist attacks and bombings are relatively rare. Compared to Baghdad, the KRG is the preferable of the two governments in terms of doing business due to the region’s relatively safe environment. Baghdad’s preferred pipeline, terminating in Ceyhan, is frequently the target of terrorist attacks. The pipeline has been bombed over thirty of times since February of this year. In August, Attackers blew up a section of the pipeline near Hadhar in Nineveh Province, whilst a complementary bomb knocked out a section near Fatha, between Kirkurk and Baiji. The flow of oil was halted for several days. Baghdad cannot defend its major oil artery to Turkey while Kurdish Iraq has witnessed comparably few attacks, and none have honed in on its energy infrastructure. If Ankara cannot trust Baghdad to protect the energy infrastructure its firms invest in (joint-venture or otherwise), while Kurdish Iraq can, the incentive to continue to explore and invest in the rest of Iraq drops dramatically in light of hydrocarbon rich and stable Kurdish Iraq. Baghdad may thus fear losing Turkish business – a doubly harsh blow as Iraqi oil exports continue to drop. If Ankara cannot trust Baghdad to protect the energy infrastructure its firms invest in (joint-venture or otherwise), while Kurdish Iraq can, the incentive to continue to explore and invest in the rest of Iraq drops dramatically in light of hydrocarbon rich and stable Kurdish Iraq. Kurdish Iraq’s potential for significant oil revenues contrast sharply with Iraq’s persistent infrastructure issues dating back to the Iran-Iraq war in the 1980’s. Northern Iraq holds massive oil reserves. Estimated oil reserves clock in at 45 billion barrels. Though less than a third of Iraq’s total, it is almost double that of the USA. Iraq’s electricity demand has increased by 400% over the past decade, the majority of plants operating off of crude oil or natural gas. When crude deliveries are delayed, the workflow of the power plants suffers. Fifty foreign firms are operating in Kurdish Iraq, accelerating growth of production capacity. These firms have spent over $20 billion to improve the oil sector. An executive at Genel, a British-Turkish oil firm that is a the largest oil producer in the area, confidently predicted that production will reach 1 million barrels per day by 2015, and quite possibly 2 million barrels per day by 2020. This rapidly improving partnership between Turkish energy companies and Northern Iraq threatens Baghdad. The KRG continues to sign deals with Turkish and other energy companies without the central government’s approval, which lessens Baghdad’s political hold over Northern Iraq. The KRG’s pipeline deals with Turkish firm, Genel, have emboldened Kurdish aspirations for political and economic autonomy. With such economic autonomy, why should Kurdish Iraq continue to seek permission from Baghdad to move forward with new business developments such as oil and gas pipelines? Though Kurds in Iraq may desire a formally independent state, policy makers within the KRG recognize that to demand formal independence could endanger their lifeblood – oil and gas production. Kurdish Iraq seems content as an autonomous region operating within Iraq. Baghdad may fear complete removal from the KRG’s business deals and would not want to lose its percentage of Kurdish oil fields. Baghdad’s economy continues to lag, and so it depends on Kurdish Iraq’s oil revenue to maintain its tenuous control over the rest of the country. In accordance with the Iraqi Constitution and KRG law, revenue would go first to Baghdad who would return 17% of the hydrocarbon revenue to the KRG and redistribute the rest among Iraqi provinces to head off another civil war. Baghdad has claimed that the KRG is keeping about two-thirds of the oil revenues. The KRG claims that under the current schema, it is receiving 12% rather than the 17% it is entitled to. The rise in Northern Iraq’s energy fortunes and the associated warming of KRG – Ankara relations cause anxiety for Baghdad. If the Kurdish oil and gas fields are developed in a successful, timely manner, and in conjunction with foreign IOC’s, there is a chance that Turkey may view Northern Iraq as the better business partner. Disputes over the production of oil in Kurdish Iraq continue to flare between Baghdad and the KRG, but it is not a zero sum game. Though Kurds in Iraq may desire a formally independent state, policy makers within the KRG recognize that to demand formal independence could endanger their lifeblood – oil and gas production. Kurdish Iraq seems content as an autonomous region operating within Iraq. The two governments have reached a tenuous truce regarding Genel’s infrastructure development and oil revenue with the KRG, but the overarching issue of resource control remains a work in progress. The Kurdish pipeline will carry oil from Dohuk to an Iraqi town on the Turkish border, Fishkabur, where it will connect to the Turkey-Iraq pipeline. 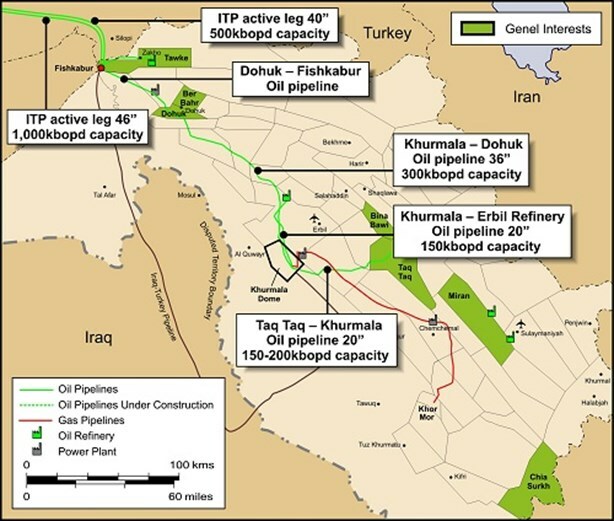 Baghdad will recognize the KRG’s deal with Genel, while in this case the KRG gives due respect to Baghdad by connecting the Kurdish pipeline to the federally controlled Turkey-Iraq one at the Turkish-Iraqi border. This combines pipeline safety while technically transporting Kurdish oil through a portion of Baghdad’s pipeline. Yet Baghdad remains furious with Ankara for progressing with the KRG on oil exploration and development. The Iraqi capital claims that Kurdish oil independence will fan the splintering of Iraq. Ankara, in response to Baghdad’s unrest, has pushed for a tripartite agreement in which Turkey, Iraq, and the KRG are all involved in the sale of Kurdish-Iraqi gas to Turkey. The central government remains wary of an agreement that gives the KRG an equal standing with Baghdad, lest they cede more control to Erbil. Hydrocarbon wealth provides prosperity and growing autonomy to the Kurdish region of Iraq, yet that same blessing complicates relations with the Iraqi capital. The KRG has created a stable environment where energy firms need not fear terrorist attacks destroying energy infrastructure. These firms can peaceably explore and produce from the significant Kurdish Iraq oil field. But they can only do so if Baghdad can comes to an agreement with the KRG and foreign firms regarding the KRG’s economic autonomy. Foreign companies have caught the scent of Northern Iraq’s black gold, and are hungry to explore it – but a question remains: will the entire country or simply Kurdish Iraq benefit from plumbing Northern Iraq’s hydrocarbon wealth? Andrea Seffens is an MA student in the ENERPO program at European University at St. Petersburg.